If you have driven through Atlanta within the last month it is hard to miss the large yellow and blue tent just outside of 75/85 in Atlantic Station: Cirque du Soleil. Cirque du Soleil is known for their high-flying acrobatics and breathtaking costumes, but they aren&apos;t the only ones astonishing crowds. 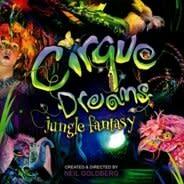 This Wednesday, Feb. 11, Athens will host a very similar show: Cirque Dreams: Jungle Fantasy at the Classic Center. The show, an America version of Cirque du Soleil, is sure to wow crowds and provide the same thrills closer to home. Tickets are available at the Classic Center website and range from $20-70 and the show starts at 7:30 p.m. I have not yet seen this show, but I am a Cirque du Soleil fan...to say the least...and I cannot wait to experience the magic here at home.